The full digital Pass'Alsace is now available on the Online Shop by choosing the option "Dematerialized pass (e-ticket, mobile app)" when you finalize your purchase order. The card is valid for 3 days over a period of 14 days. 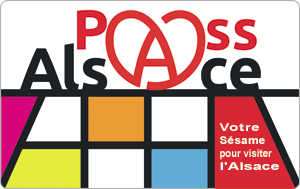 Northern Pass'Alsace is valid for 3 consecutive days or not, over a period of 14 days, and provides access to tourist sites in Strasbourg and northern Alsace only.